Salt dough is easy to work with and children enjoy the way it feels. Your children will be very proud of their ornaments. Trace the cookie cutter on paper and plan your design. Draw your design with a pencil on baked and well dusted cookie. The colours shown here can be used as an example but any color you desire is fine. Allow paint to dry a few minutes when painting sections for instance the tail feathers side by side. 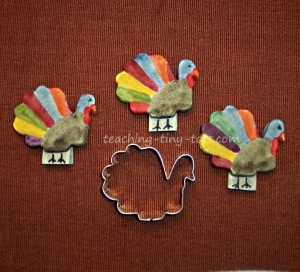 Cut out a strip of cardboard 1" x 3" , fold in half and glue on back of the turkey leaving 1/2" at the bottom showing. Let the glue dry for an hour or so and with a black fine tip Sharpie, draw the legs on the cardboard at the bottom and make a dot for the eye. Adult help is needed, Sharpie is a permanent marker. 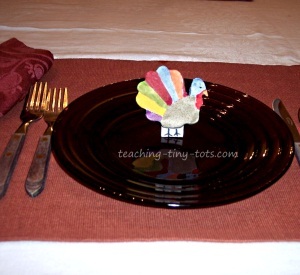 Prop up the turkeys using their cardboard stands and place where desired. This project is best done in two days. The first day make the dough, cut it out and bake. On the second day decorate and display. Don't make the dough in advance or use leftover dough. Alum is optional. Alum is an astringent that aids in binding the ingredients. Cookies larger that 2 1/4 inches may not dry flat. If you are experiencing this, allow the cookies to dry at room temperature for 24 hours on a floured cookie sheet, then continue to dry out in warm oven. Most average size cookies are dry in 24 hours. Great recipe to write out to enhance the toddler activity. Helps to build fine motor skills.